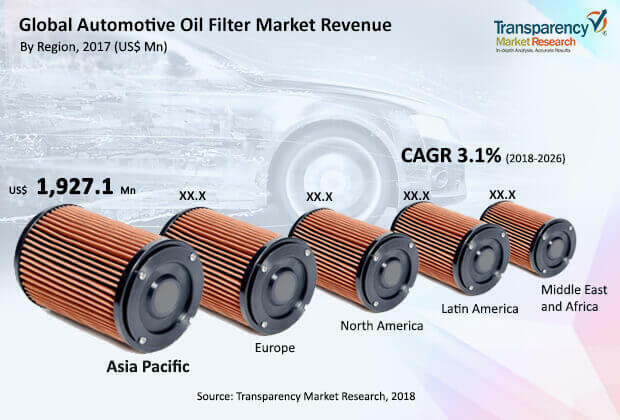 In 2017, Asia Pacific held a prominent share of the global oil filters market for automotive. The market in Latin America is expected to witness significant expansion, owing to the increase in production of vehicles in countries of Latin America. Key factors that are driving the market in these regions are an increasing need for efficiency and productivity coupled with the stimulus to increased industrial activities. IC engine vehicle production is high in Asia Pacific countries such as China, Japan, and Korea, which are simultaneously paying more emphasis on the commercialization of electric vehicles and fuel filter and engine oil filter segments of the market in these countries are likely to expand at a moderate growth rate during the forecast period. Increasing production of passenger vehicles in emerging countries such as India and Indonesia, owing to several factors such as lower cost of production, better economic condition, better GDP per capita income, launch of affordable car models targeting the low income groups, launch of app based cab facility such as OLA, Uber, and lowered car interest rates are anticipated to drive the automotive oil filters market in Asia Pacific region during forecast period. The oil filter for automotive market witnesses the presence of several players, as manufacturing of oil filters is not a highly complicated and expensive affair. Numerous regional players dominated the market for particular applications and the aftermarket segment. Major players operating in the global oil filter market for automotive include Sogefi SpA (Italy), MAHLE GmbH (Germany), MANN+HUMMEL GmbH (Germany), A. L. Filter (Israel), Robert Bosch GmbH (Germany), Donaldson Company, Inc. (U.S.), North American Filter Corporation (U.S.), Fildex Filters Canada Corporation (Canada), K&N Engineering, Inc. (U. S.), Filtrak BrandT GmbH (Germany), Luman Automotive Systems Pvt. Ltd. (India), ALCO Filters Ltd. (Cyprus), and Siam Filter Products Ltd., Part. (Thailand). Key players are focusing more on mergers and acquisitions with regional players in order to expand their business. Several prominent players are concentrating more on R&D activities in order to improve the functionality and efficiency of the oil filter. This report analyzes and forecasts the market for automotive oil filters at the global and regional level. The market has been forecast based on revenue (US$ Mn) and volume (Million Units) from 2018 to 2026. The study includes drivers and restraints of the global oil filter market for automotive. It also covers the impact of these drivers and restraints on the demand for automotive oil filters during the forecast period. The report also highlights opportunities in the oil filter market for automotive at the global and regional level. The study provides a decisive view of the global oil filter market for vehicles by segmenting it in terms of type, fuel type, vehicle, and region. These segments have been analyzed based on present and future trends. Regional segmentation includes the current and forecast demand for automotive oil filter in North America, Europe, Asia Pacific, Latin America, and Middle East & Africa. The report also covers the demand for individual application segments in all regions. The study includes company profiles of major players operating in the global oil filter market for automotive. Key players in the oil filter market for automotive include Sogefi SpA (Italy), MAHLE GmbH (Germany), MANN+HUMMEL GmbH (Germany), A.L. Filter (Israel), Robert Bosch GmbH (Germany), Donaldson Company, Inc. (U.S.), North American Filter Corporation (U.S.), Fildex Filters Canada Corporation (Canada), K&N Engineering, Inc. (U.S.), Filtrak BrandT GmbH (Germany), Luman Automotive Systems Pvt. Ltd. (India), ALCO Filters Ltd. (Cyprus), and Siam Filter Products Ltd., Part. (Thailand). Market players have been profiled in terms of attributes such as competitive landscape, manufacturing footprint, company overview, financial overview, business strategies, and recent developments. The market for automotive oil filter is primarily driven by the rising demand for eco-friendly vehicles. The report provides the estimated market size of automotive oil filter for 2017 and forecast for the next nine years. The global market size of automotive oil filter has been provided in terms of revenue and volume. Market numbers have been estimated based on key fuel type, filter type, vehicle type, sales channel, and regional segments of the oil filter market for automotive. Market size and forecast for each major type and vehicle have been provided in terms of global and regional/country markets.